Description: This herbaceous perennial plant is up to 4' tall and unbranched, except near the inflorescence. The central stem is strongly four-angled and hairless. 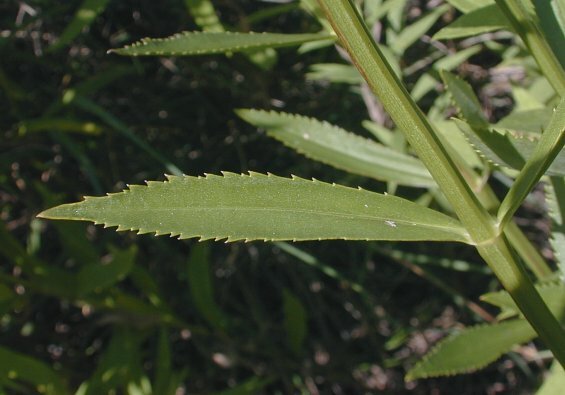 The opposite leaves are up to 5" long and 1½" across. They are sessile, hairless, lanceolate or oblanceolate, and have sharply-pointed widely-spaced teeth along the margins. The inflorescence consists of tall spikes of flowers at the ends of the upper stems. A spike is up to 10" long and consists of 4 rows of densely packed horizontal flowers or their buds. 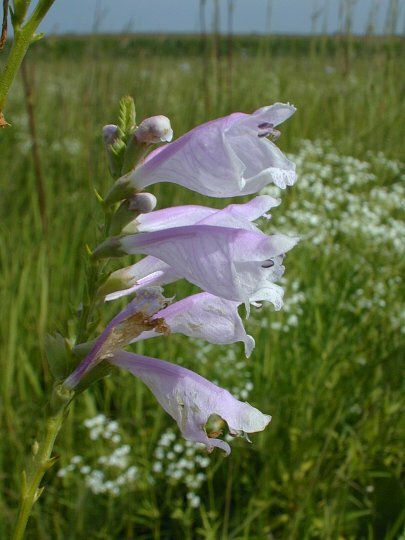 The tubular flowers are white, lavender, or purplish pink, and they often have dots, fine stripes, or swirls of a slightly darker color. Each flower is about 1" long, has 2 lips, while 4 purple anthers are visible near the upper lip. This upper lip is a broad hood, while the lower lip is divided into 3 lobes – the larger central one functioning as a landing pad for insects, which is accompanied by 2 smaller side lobes. The flowers have no scent. The blooming period occurs during late summer to early fall, and lasts about 1½ months. Each flower produces 4 sharply angled, dull brown seeds. The root system consists of a central taproot and rhizomes. The latter promote the spread of this plant vegetatively. Cultivation: The preference is full or partial sun, and moist to average conditions. Growth is best in rich loamy soil, but it can contain some gravel or clay. During droughts, the lower leaves may turn yellow and fall off the stem. Otherwise, the foliage has fewer problems than most mints. This plant is easy to grow if the site is not too dry. At moist sites, it sometimes spreads aggressively. 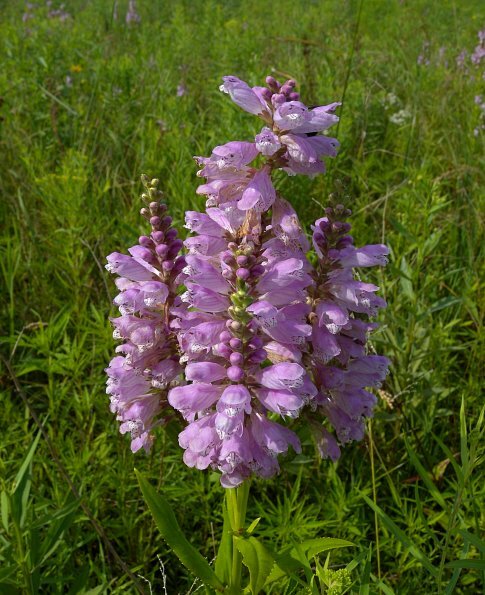 Range & Habitat: The native Obedient Plant occurs occasionally in scattered counties throughout Illinois (see Distribution Map). It is less common in the western and southern portions of the state. Habitats include moist to mesic black soil prairies, thickets, openings in woodland areas and along woodland borders, moist meadows along rivers and borders of lakes, seeps, limestone glades, and open moist areas near railroads. Faunal Associations: Bumblebees are the most important pollinators of the flowers. Occasionally, other long-tongued bees and the Ruby-Throated Hummingbird may visit the flowers. These visitors seek nectar from the flowers. Like other members of the Mint family, the Obedient Plant is probably not a favored source of food for mammalian herbivores. Photographic Location: The photographs were taken at a prairie of Meadowbrook Park in Urbana, Illinois, and at the Loda Cemetery Prairie in Iroquois County, Illinois. Comments: This plant is often grown in flower gardens, and some populations may represent escaped plants from cultivation. Usually, the horticultural forms are more rosy pink or purple in appearance than native wild populations, which are usually white with light pink or purple tints. Because the individual flowers stay in place when moved, one common name is 'Obedient Plant,' as used here. Another name is 'False Dragonhead' on account of the fancied resemblance to a European plant by that name. While this is a pretty plant, its ecological value to birds, mammals, and insects is fairly low.